If you need an entertaining distraction from the onslaught of ridiculously serious political drama online and offline, where heated, sometimes ungrammatical (“bias” ka! 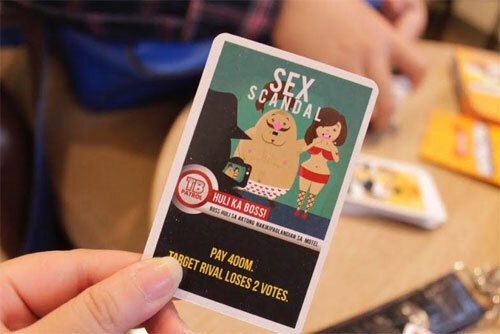 ), exchanges between supporters of opposing candidates can result in unfriending sprees and brawls, then look no further than political satire card game, Politricks, the first political card game in the Philippines. 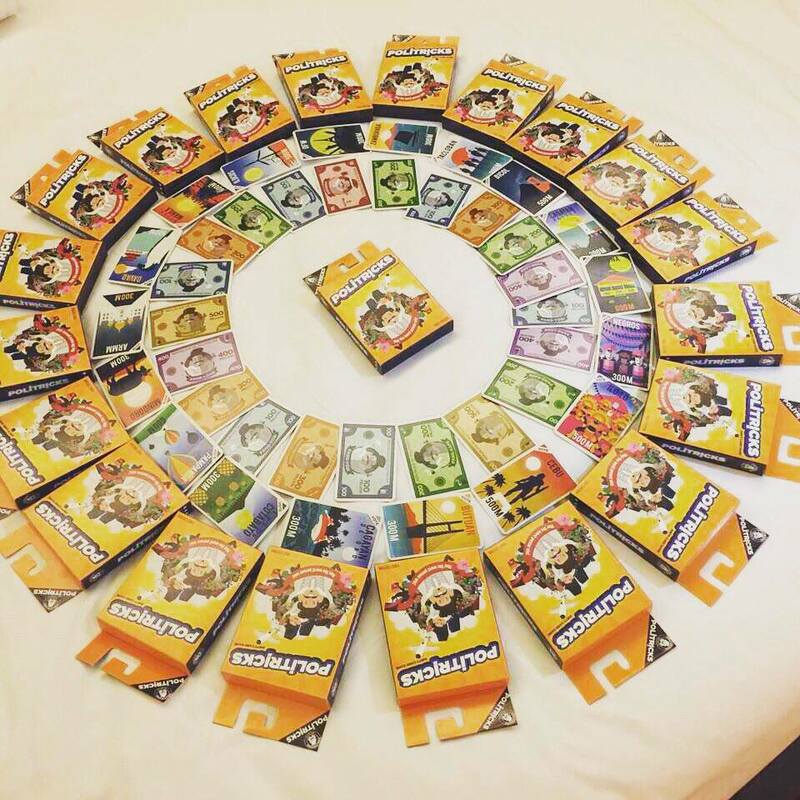 The game’s mechanics are a mix of Monopoly Deal, Uno, and other Take That-style (the genre, not the boyband) card play. “We wanted to make a sort of satire about Philippine politics,” creator RB Ting says. “Because it’s been happening since the dawn of our history. Since the Heneral Luna period, all these insane tricks over and over again. It may be their first foray into making games, but a lot of research and planning went into the creation of Politricks. For instance, the creators consulted with a leftist congressman, an elections watchdog, and the common folk about the current political atmosphere. It took the team a year to conceptualize and work on the game before they finally launched it last February. Ting and co-creator PJ Lim even crashed a media forum on narco-politics and the oil industry and marketed their game to a crowd of journalists and officials that included Senator Koko Pimentel. 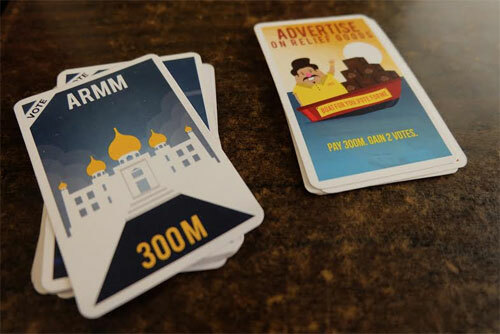 They want to change the country’s voter decision-making skills with a pack of cards. Politricks features a portly gentleman with a well coiffed ’do (his hair is big ’cause it’s full of secrets), sporting a tacky golden watch (costing well beyond his declared salary), and wearing a classy piña fabric barong tagalog (naturally funded by clueless taxpayers) greets you on the front cover. His name is Sir Pol, and he is Politricks’ own version of Monopoly’s Rich Uncle Pennybags. Sir Pol is your typical poster boy trapo, who personifies nefarious political tropes and common issues in a cartoonish, manner—similar to the aesthetic of The Oatmeal’s Exploding Kittens. You’ll see him dancing onstage, taking selfies with tycoons, canoodling with his mistress, and staging a coup d'état among other things. You’ll also see actual pigs representing the Pork Barrel Scam. Ting, Lim, and their team of co-creators keep the game’s design light-hearted to prevent the subject matter from getting too grim and depressing. Most of humor stems from real-life problems after all. Of course, the main objective of Politricks is to win the elections by any means necessary—legal or illegal. From epal posters and showbiz endorsers, to stealing votes and bullying voters. Anything is possible! Politricks is a quick-play game, requiring at least 15 minutes of your time, which is perfect for the casual gamer. The gameplay is so simple to learn even a kid can understand it—although, we wouldn’t advise kids to play since the box suggests it’s for mature players only. You could even dive into Politricks without any prior knowledge about politics. The cards would probably educate you more as a voter than a symposium. 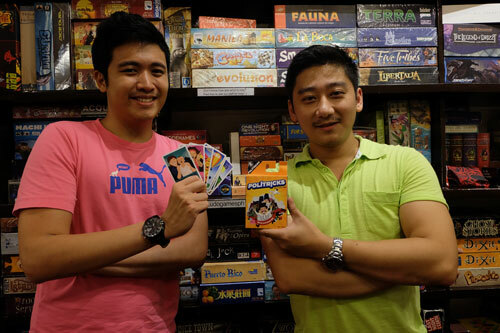 Lim and Ting suggest not hoarding too much money since it can be stolen when other players team up to bring you down. And should they all gang up on you in the game? Worry not, corrupt candidate, because there are some equally underhanded moves you can pull off in order to stop your rival in his tracks such as the “Flee The Country,” “Bishop Opposes,” “Freeze Bank Account” and “T.R.O.” cards. Like in real life, alliances in this game are fleeting and formed out of necessity and self-interest. Walang kaibi-kaibigan nga naman. The “Riding In Tandem” card even forces a rival to become your running mate, banning them from attacking you. After all, you’re still vying for the prized seat in government. Due to the chronic backstabbing nature of Politricks, nobody holds the lead for too long. 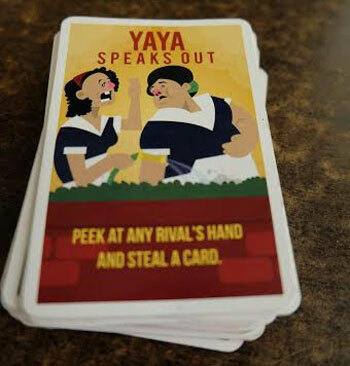 The most powerful card in the deck is the “Ambush” card, which permanently ousts a player from the game, giving you all his votes for the low, low price of 1.5 billion pesos. It kinda works like the much-reviled Blue Shell in Mario Kart. Much like Mario and Monopoly, Politricks is the kind of friendship-ruining game we’d play over and over again. 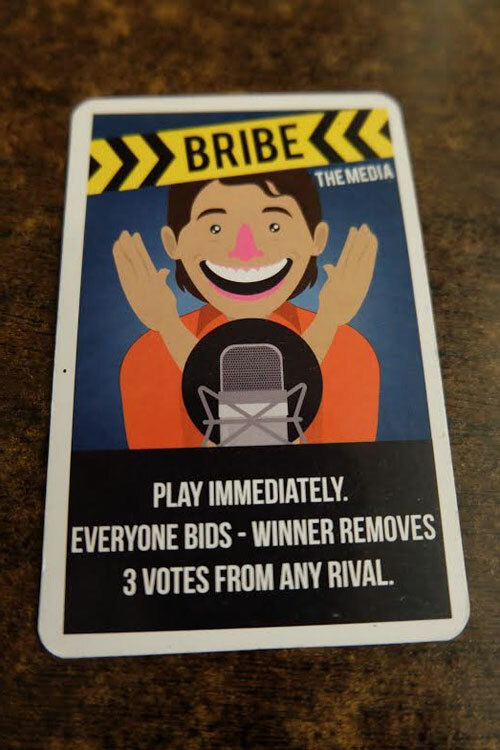 When playing the game, Lim and Ting wanted gamers to feel like they were actual corrupt politicians. 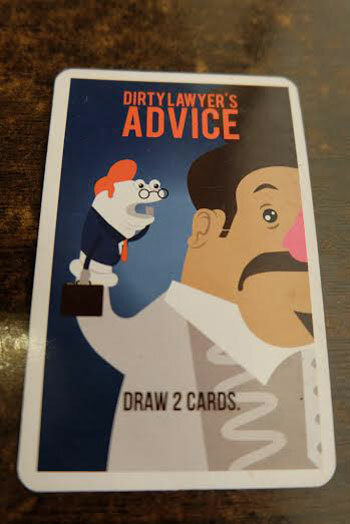 There is no “clean” action in this deck of cards. It helps the would-be voter to get into the mindset of a politician. Through humor and experiential gameplay, Lim and Ting hope players/voters will have a better understanding of Philippine politics. That they may think of results for themselves instead of complaining about the current state of affairs. 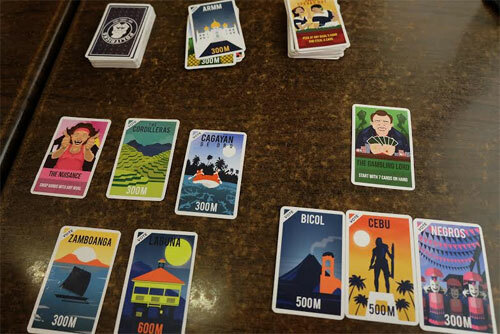 Politricks (P600) is available at the following stores: Laruan Atbp, Snacks & Ladders, Fire Sword, Ludo, Dyce & Dine, Puzzles, Onboard Game & Gastropub and Burger Company. They are also available at game shops such as Neutral Grounds, and online at Gaming Library, Abubot.ph, and directly from their Facebook page.